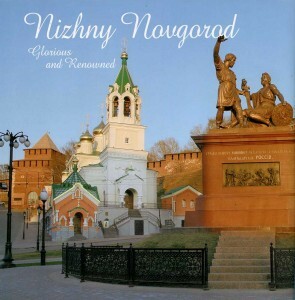 Nizhny Novgorod has been referred to as renowned and glorious since bygone days. No doubt that it was not only for mere benefit but also because of inspiration that Prince of Vladimir and Suzdal Principality Yuri Vsevolodovich, a grandson of Yuri Dolgorukiy and the founder of Moscow, founded the city of Nizhny Novgorod up high on the Volga river, so open and wide, which makes you think about freedom and glory, in a place where the land and the sky are so close. 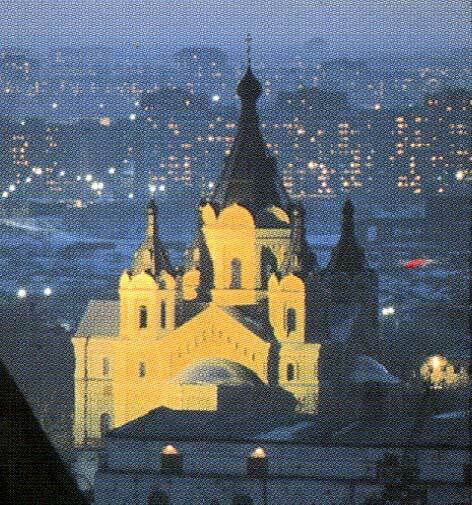 The first dateline in the history of Nizhny Novgorod is 1221, the year when the city was founded. 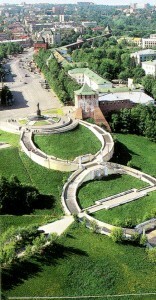 Nizhny Novgorod was a citadel in the east of Rus’, it was a warrior and a merchant, a craftsman and a farmer. It was burnt down and revived again. It has always been proud of its history, of a cathedral with frescoes of the inimitable Pheophan Grek, the Laurentian Codex, copied in 1377 upon the blessing of Bishop Dionisiy, the founder of the Pechersky Monastery, the warriors who helped Dmitry Donskoy win the Kulikovo battle and the craftsmen who forged swords and made beautiful jewelry. The main sight in Nizhny Novgorod is the Kremlin, a unique building which combines stern medieval vallum and towers and classical style of the 19th century. It was initially designed in accordance with all standards of the military-defense science and was nevet taken over despite numerous sieges. There used to be 14 towers in the Kremlin, now there are only 12 left. In summer you can get onto the Kremlin wall via the Kladovaya Tower and make a walk to enjoy the Volga landscapes and the view over Strelka. The first cathedral to be built in Nizhny Novgorod is the tent-like Archangel Mikhail Cathedral inside the Kremlin, one of the best in the region. 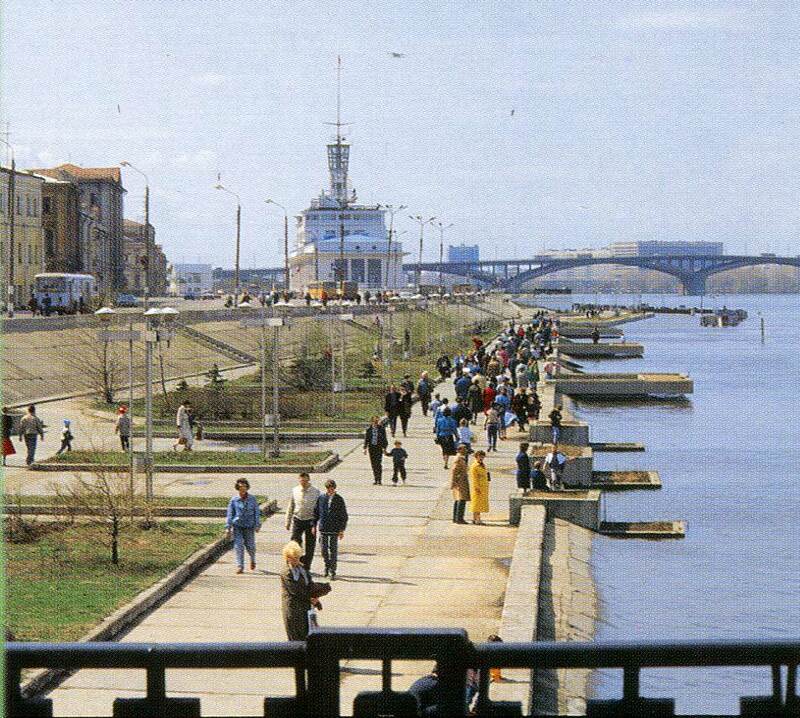 Nizhny Novgorod has been referred to as renowned and glorious since bygone days. No doubt that it was not only for mere benefit but also because of inspiration that Knyaz Vladimir and Suzdal Principality Yuri Vsevolodovich, a grandson of Yuri Dolgorukiy and the foundet of Moscow, founded the city of Nizhny Novgorod up high on the Volga river, so open and wide, which makes you think about freedom and glory, in a place where the land and the sky are so close. 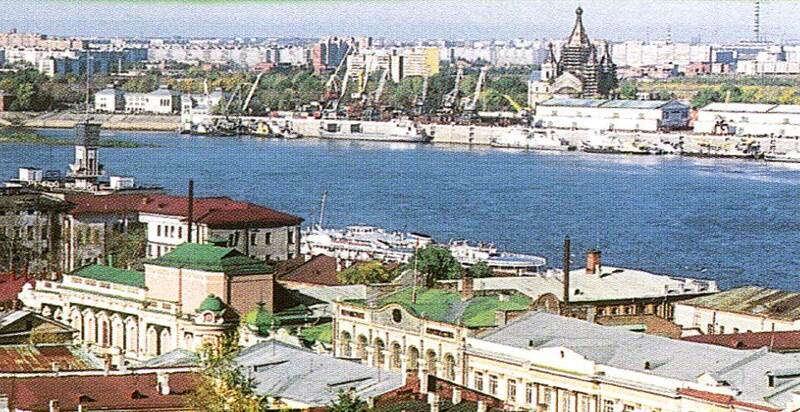 The first dateline in the history of Nizhny Novgorod is 1221, the year when the city was founded. View Chkalov staircase from the height of bird flight. Nizhny Novgorod was a citadel in the east of Rus’, it was a warrior and a merchant, a craftsman and a farmer. It was burnt down and revived again. It has always been proud of its history, of a cathedral with frescoes of the inimitable Pheophan Grek, the Lautentian Codex, copied in 1377 upon the blessing of Bishop Dionisiy, the founder of the Pechersky Monastery, the warriors who helped Dmitry Donskoy win the Kulikovo battle and the craftsmen who forged swords and made beautiful jewelry. 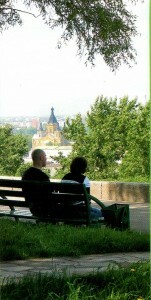 The first datline in the history of Nizhny Novgorod is 1221, The year when it was founded. The main sight in Nizhny Novgorod is the Kremlin, a unique building which combines stem medieval vallum and towers and classical style of the 19th century. It was initially designed in accordance with all standatds of the military-defense science and was nevet taken over despite numerous sieges. There used to be 14 towers in the Kremlin, now there are only 12 left. In summer you can get Onto the Kremlin wall via the Kladovaya Tower and make a walk to enjoy the Volgalandscapes and the view over Strelka. The first cathedral to be built in Nizhny Novgorod is the tent-like Archangel Mikhail Cathedral inside the Kremlin, one of the best in the region. It was first built in wood when the city was founded and was last rebuilt in stone in 1631, following the victory of the Nizhegorodian militia against Polish-Lithuanian invasion, headed by Kuzma Minin and Dmitry Pozharsky. Another notable landmark is the Annunciation Monastery, one of the most famous in the region, its history goes back to the times when Nizhny Novgorod was founded. It was restored at the end of the 20th century and now looks as it did in the 17th century. The Theotokos Nativity Church in the Russian baroque style is a masterpiece of the regional and Russian architecture. It was built in the early 17th century, funds given by the famous Stroganov, who owned salt mines. The church is beautifully decorated with an ornate golden carved iconostasis. Once you go there, you will be impressed by its beauty and splendour. The New Fair or Alexander Nevsky Cathedral looks very monumen and reminds of a medieval castle, it was built in the late 19th century funds given by local merchants. Nizhny Novgorod was famous by its merchants, thete are still some images of this in the city — they are the building of Nizhny Novgorod Fair, the Old Fair Saviour Cathedral, reminding of the St. Isaac Cathec in St. Petersburg, ornate merchant houses of the 19th and early 20th centuries. There are also merchant houses built eatliet — stone edifices of the pre-Petrine epoch — Old Russian-tower-like houses of Chatygii Pushnikov, and Olisov. 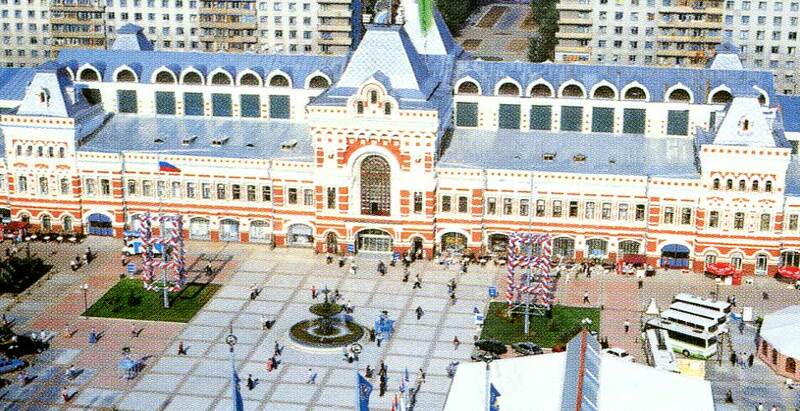 Nizhny Novgorod Fair, which prospered, was a symbol of entrepreneurship and generosity of Russian merchants. The trade centre was designed by Agustfn de Betancourt, a famous European architect. 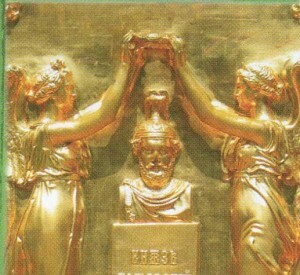 The trade fait was called the Nizhegorodian Babylon and the city the pocket of Russia. A great number of famous people visited of Nizhny Novgorod, including Alexander Pushkin and Taras Shevchenko, Theophile Gautie and Alexander Dumas, Fedor Dostoevsky and Vladimir Korolenko, Anton Chekhov and Alexander Blok, Yulius Fuchik and Theodore Dreiser, Vladimir Mayakovsky and Aleksey Tolstoy. There are placeds related to Miliy Balakitev, Boris Mokrousov, Vladimir Dal’, the author of the Russian thesaurus, Pavel Melnikov-Pechersky, the author of «In the woods» and «In the mountains” novels, Nikolay Lobachevsk a famous mathematician, Rostislav Alexeev, a designet of hydrofoil ctaf Pavel Florensky, a sophist, Andrey Sakharov, a scientist and a civil-right activist. 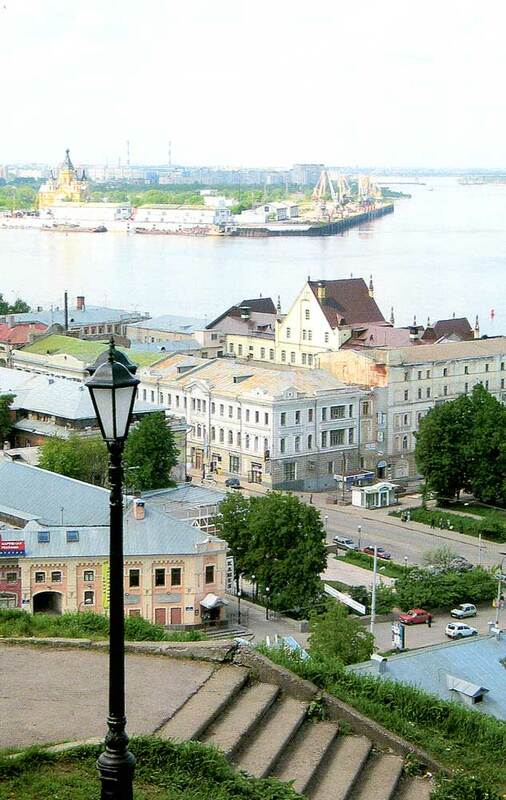 Nizhny Novgorod is the native town of wotld-famous Maxim Gorky. It should be noted that the city has the name of Gorky from 1932 to 1990. You can learn more about the history of the city, the life and traditions of the past and about the personalities it is proud of in its museums and exhibition halls. The largest museum in the region is the museum complex of history and architecture of Nizhny Novgorod, which consists of seven museums. If you go to the Schelkovsky Khutor Museum of Folk Architecture and Culture you will learn there about the traditions and culture of various folks that reside in the region. In Bolshaya Pokrovskaya street there is the Museum of Handcrafts, which tells the history of various crafts, including the famous Khokhloma. In Dmitrieskaya Tower of the Kremlin there is one of the oldest museums in the city — in 1896 Nizhny Novgorod hosted the All-Russi Exhibition of Industry and Arts. In Ivanovskaya Tower there is a display on the Nizhegorodian militia movement of 1612. In the Kremlin there is one more museum, situated in the former House of Military Governor, — the Art Gallery. There is a collection of 12,000 masterpieces of foreign and Russian artists, including its major masterpiece — a collection of Russian national painting, from — Old-Russian frescoes to modem arts. 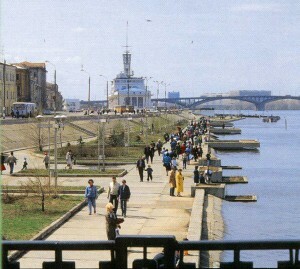 Nizhny Novgorod city on the Volga river. 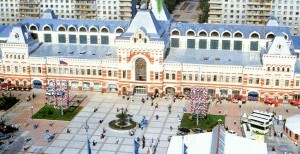 Nizhny Novgorod fair from height of the bird’s flight. 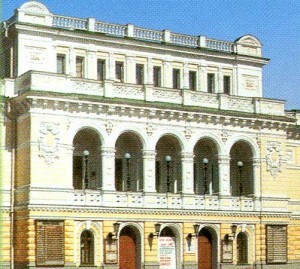 There are also museums where one can learn about the life of famous residents of Nizhny Novgorod. These are the Museum of Nizhny Novgorod Intelligentsia, the Maxim Gorky Museum of Literature, the Sakharov and Dobrolyubov memorial museums. If you go to the Museum of Gorky Automobile Plant (GAZ) you will have a chance to see a large collection of vehicles manufactured by the plant at all times. 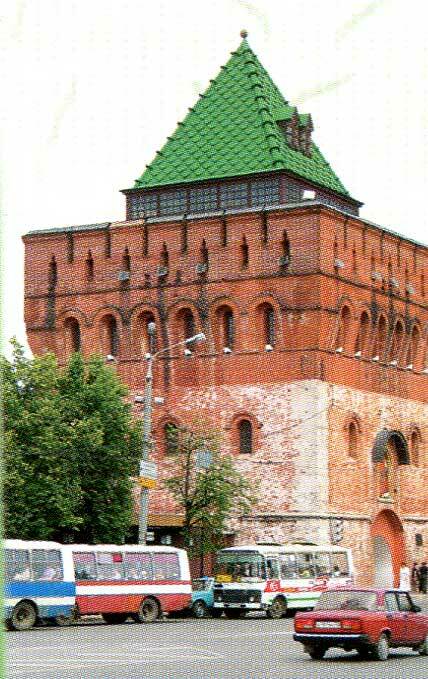 The tower of the Nizhny Novgorod Kremlin. The main in Nizhny Novgorod sight in is the Kremlin. There is a museum at the Sokol aircraft plant, where unique models of MIG fighters, YaK planes, air-cushioned amphibious craft and other top-secret aircraft models are exhibited. There are many galleries and exhibition halls on the central square of Nizhny Novgorod — the Minin and Pozhatsky square — and the main pedestrian street — Bolshaya Pokrovskaya. 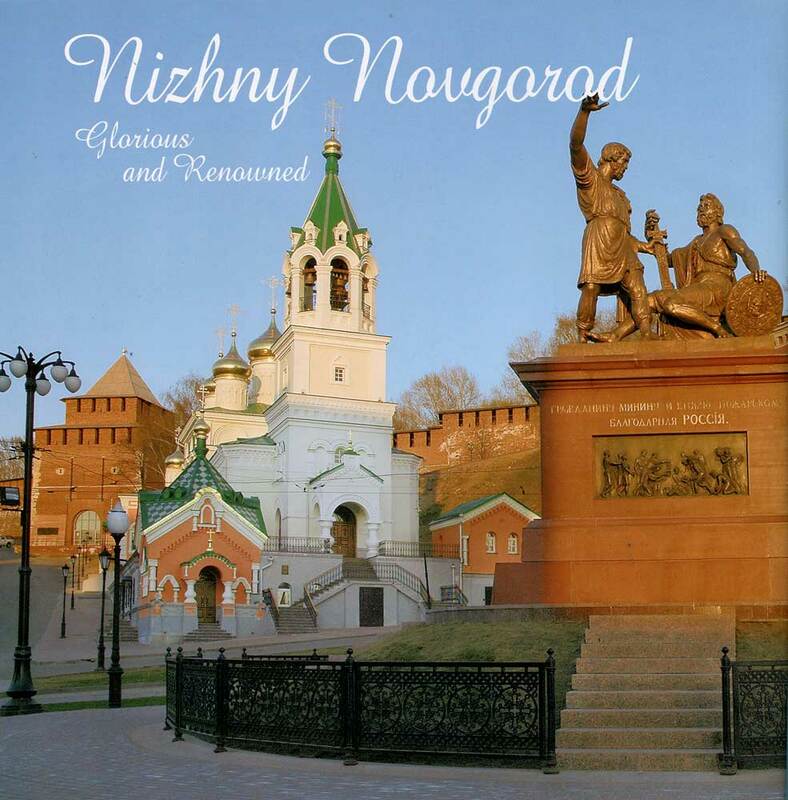 It takes at least a week to get into details of the history and culture of Nizhny Novgorod. Travelers can stay at comfortable hotels — Alexandrovskiy Sad, Volna, Zhuk Zhak, Nikola House, Oktyabrskaya, Na Ilyinke, Sergievskaya, Centralnaya, Nizhegorodskaya, Oka, Bereg and others. There are a great number of cafes and restaurants, most of them are located in the centre of the city, in particular in Minin and Pozharsky sq., in Bolshaya Pokrovskaya, Alexeevskaya and Rozhdestvenskaya streets. There are also numerous places for entettainment, cinemas, snooker rooms, bowling centres and night clubs. You are always welcome to Nizhny Novgorod!